Sooo two coconut posts in a row… I hope you’re on-board this coconut-obsessed train because I am 100% there and will pull you along with me. I always feel like I’m in the minority by liking coconut – bountys are ALWAYS the chocolates that are leftover from a box of Celebrations. I mean, I’m not upset about that fact because I could eat my weight in them given the chance. But I think it’s a ‘marmite situation’ where you either hate coconut or you really really like it. I am one of those coconut-crazy people. Which is why when I got the chance to read through Emily’s new book (!!) Rawsome Vegan Baking, that I KNEW that I would be making these raw vegan coconut treats asap. Come on, a healthy version of candy that I can actually convince myself is good for me. No weird additives or anything. That means it’s okay when I eat 4 in one go right? Its nourishing my body, guys. Nourishing candy. Enough said. Alright I’ve convinced myself, I’m eating 6, whatever. Lucky for you lovely readers, I’ve been generously given the opportunity to host a giveaway!! 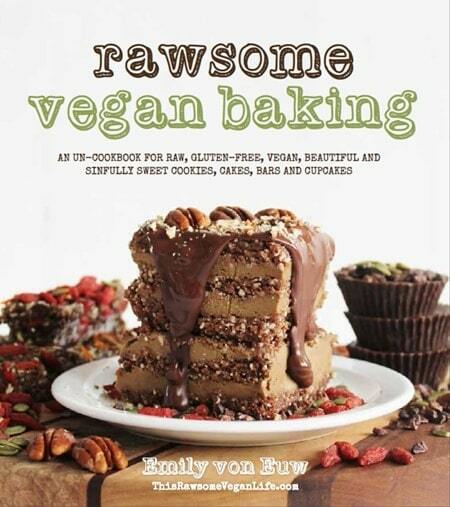 That means you can win a copy of Rawsome Vegan Baking alll for yourself. It’s an amazing book full of wholesome, simple recipes that are to-die-for (how good does raw Maple Pecan Pie sound??! What about raw Oreos or Tahini-Coffee Cream Cups?). The giveaway ends on the 23rd of March at 12am (London time), when winner will be randomly selected, announced on here in the Rafflecopter box and contacted via their provided e-mail address shortly afterwards. Bonus treat! 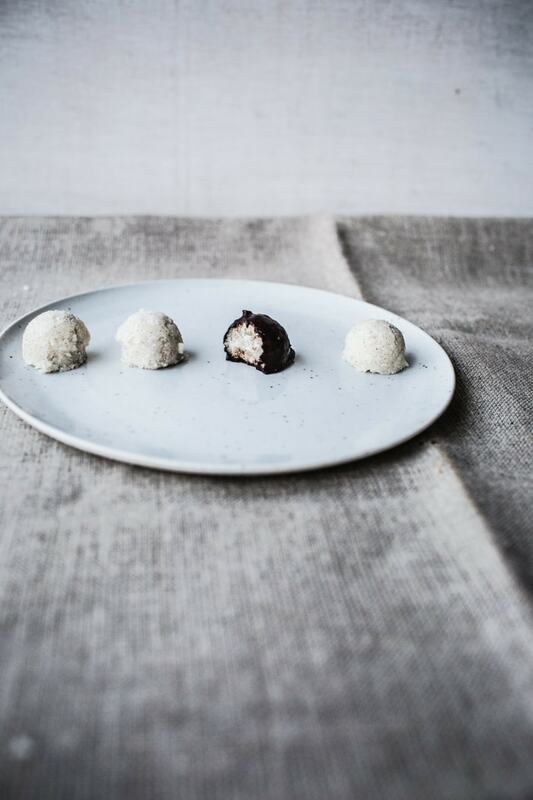 I’m also sharing the recipe for these raw almond joys which Emily has SO CLEVERLY made healthy. The recipes I’ve seen before for homemade almond joys usually involve using a heck load of sugar to bind the coconut together into a sticky dough. What this recipe does instead is essentially use half of the coconut to make coconut butter (I ended up making extra coconut butter at the time because I wanted it for shnacking! Coconut butter is mega good on toast. You can follow suit, I’m not judging.) which binds together the rest of the coconut along with some honey. I hope you’ve got your blenders out already. This recipe is stellar. – I used unrefined, virgin coconut oil instead of cacao butter in the chocolate coating and it worked fine! – I used raw honey as the liquid sweetener in the chocolate coating (making the coating not vegan). If you want to make it vegan either use maple syrup (which is not raw) or agave nectar. – I used a 30 ml cookie scoop to portion the coconut centers into smaller portions instead of just dividing the mixture into 6. Put half of the coconut into your food processor and process until you get a chunky butter consistency; it may take several minutes. Add the rest of the ingredients, including the remaining coconut, and process until it all sticks together. If it’s too dry, add more coconut oil or agave nectar. Press this mixture into flattened balls and put in the fridge for an hour, until they set. Then dip in the chocolate and allow the chocolate to set. Finally—eat. To be honest you already had me at “coco..” in the last post and now this happens: coconut, chocolate aand vanilla? That’s a win, win and win for sure! I might be one of the few who hasn’t had the real almond joy thing like ever, ’cause they just aren’t available here, but these little goodies look awesome without even knowing the almond-y inspiration ;-). Luckily there are mostly coconut lovers around here, which means a lot of people to share with to keep me from eating the whole batch on my own. But that might happen anyway, I’m already drooling about your gorgeous (!!) photos! “Bounty balls” made me laugh out loud. The cookbook looks quite lovely, but sadly rafflecopter says that the giveaway has not started yet. When would we be able to apply for the giveaway? whoops sorry about that! should be fixed now 🙂 enter away! Would love some new gluten-free desserts to try! Am wishing I had some shredded coconut around right now to make these…. I think that I’d like to come live with you.. I am sooo on that coconut train with you! Just made a vegan coconut cream pie for Pi Day! My favorite way to get a coconut fix is the coconut chips from Trader Joe’s – they are sooo delicious! These look great! My favorite way to get a coconut fix is through my latest pie I just made. Recipe can be found on my blog here….it’s a Toasted Coconut Banana Cream Pie! woahhh that looks crazy delish! 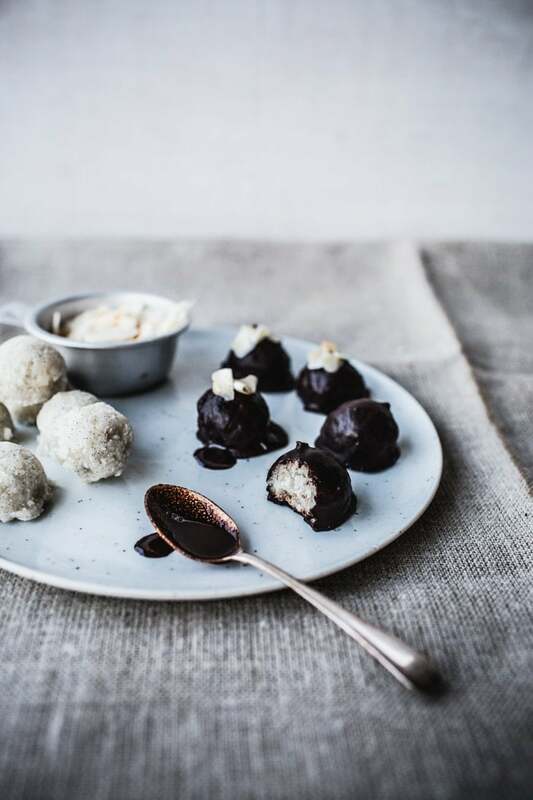 I get my coconut fix by constantly being inspired by recipes like this one… and then not being able to help myself when it comes to trying them out! These look AMAZING… I know what I’m doing this weekend. 😉 Beautifully captured by the way! I love how you kept some country neutrality and posted all the candy bar names. lol But this looks so good, it will be on my next snacking to-do list. I like to throw coconut in a berry smoothie! These. look. heavenly. Like seriously my mouth is watering. I will DEFINITELY be making these this weekend and will let you know how they turn out. My favorite way to get a coconut fix is by eating almond joys. I think they are the American version of Bountys because they are usually the candy at the bottom of the halloween box haha. my favorite coconut fix is coconut butter on cinnamon raisin toast! Love that recipe 🙂 Great blog!! or coconut flour mixed with almond milk to make a fluffy coconut cream to top sweet potato (or anything else) with. My favourite way to get a sweet coconut-y fix is whisking a little coconut oil into hot chocolates. Perfection. Love this! Beautiful photography. From a bounty bar, dark preferably. Coconut porter! Food-wise, I always love coconut curry and almond joys. I love dried coconut on top of my yogurt! I love to sprinkle coconut on different kinds of cakes. I am SO excited to try these tasty treats and would love to try out the cookbook! Favorite way to get my sweet coconut fix… Blending fresh coconut meat with frozen or fresh mango, then spooning it over a chia pudding made with coconut milk, agave syrup and a dash of cinnamon. Then a sprinkling of shredded coconut and toasted almonds on top! My favorite coconut fix is making a coconut butter candy – putting soft coconut butter in a pretty silicone ice cube tray, then drizzling some melted chocolate chips to create thin layer for their bottoms. If only I could reach in and grab one!! Now I’m going to be thinking about them the whole day at work 😀 looks amazing!! I love chocolate coconut cream pie! I usually mix in some coconut to the banana pudding and then toast some to sprinkle on top of the whipped cream. Delicious! Coconut fix? Coconut ice cream (dairy free of course!) with pineapple and toasted coconut flakes. Winning combo, hands down. Eating a coconut of course! Raw coconut is amazing! I can’t control myself around regular candy, so I can’t imagine NOT eating the entire batch of these healthified treats. Yum! I recently made some cookies with coconut oil, almond meal/flour, honey, vanilla, baking soda, salt and mini chocolate chips. I think the dough is even better than the baked cookies. wow! these look amazing. can’t wait to try them. These look great! I love chocolate with coconut best! I get my coconut fix by adding coconut to everything. Everything. I am so smitten with the stuff. coconut in smoothies, coffee, tea, juice, desserts, salads…on and on…coconut is my fav! I am one of those people who’s not a big fan of coconut, but I have to admit these look soo good! Oops I Forgot to answer the question hahaha… definitely my favourite way to get that coconut fix is by sprinkling coconut on everything, and using coconut for all purposes!!! Samoa cookies, OMG. You’re looking at an ex-girlscout right here! Yes freaking pleaaaase!! So yummy looking! Holy cow yes please!!! my fav way to eat coconut is toasting flakes in the oven with kerrygold butter/ coconut oil, and sea salt!!!! Mmhm. “Nourishing candy” … I must make these! Coconut, chocolate – what’s not to love? Coconut cream pies with raw ginger crust – Delicious & Rawsome! I love to drizzle coconut milk over oatmeal in the morning! I love coconut and use it daily….my favorite way to get my coconutty fix is to take a teaspoon or a little more of coconut butter and just eat it….stops all my cravings for sweet things. I put unsweetened coconut on my corn flakes instead of sugar. It still sweetens them up! Coconut is my absolute favorite! Really in any form. I especially love coconut ice cream or sorbet..
Coconut oil instead of butter on my cinnamon sugar toast. I get my coconut fix from macaroons, or my fave, toasted in granola! I’m a coconut fiend myself. I love the creaminess coconut lends to ice creams, but since it’s still winter here, thai coconut soup. I like to put a little on my overnight oats! I love Emily’s blog! 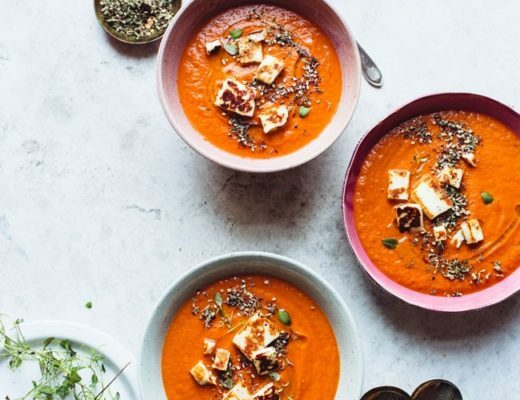 Not only are her recipes and photos perfectly scrumptious (even through a computer screen), but she also shares such a positive, beautiful zeal for life and health. I always feel uplifted after visiting her little corner of the internet. Coconut butter on toast is awesome! I’ve been meaning to make my own coconut macaroons for some time (I love the raw macaroons from Emmy’s Organics). A raw macaroon cloaked in chocolate is even more appealing! I love, love, love macaroons. I had some at Dahlia Bakery in Seattle and I wish I could replicate them! No luck yet. These look amazing saving and pinning! coconut butter and honey right on toast…can’t live without coconut! a generous sprinkling of toasted coconut on almond butter toast is divine! I love smitten kitchen’s double coconut muffins! My favorite way to get a coconut fix is with macaroons or raw almond joys. Mmm…yummy! I am the same! Any thing coconut and I am in heaven! coconut + chocolate = match made in heaven. seriously drooling over these! I love to make popcorn w/ Coconut Oil! I eat all the coconut chocolates in every box of chocolates, and put shredded coconut on EVERYTHING! I love coconut ice cream when it has the bits of coconut flakes… so good! I love topping my brownies with a chocolate ganache and coconut flakes! My favorite way to get a sweet coconut fix is through coconut milk-based ice cream. Thank you so much for showing us that blog and the book. I have been looking for a good raw bakingblog for a while!! I’m totally on board with this coconut thing – I love it! Bounty are my favourite chocolate bar, so these look incredible! Oh meh lawd I love coconut! I currently have the following in stock: coconut oil, coconut butter, coconut sugar, coconut flour, coconut milk, coconut yogurt, and shredded young coconut. It’s getting serious up in this coconut-loving kitchen. My favorite way to enjoy coconut is by topping my vegan Oreo pancakes (recipe thanks to Chocolate Covered Katie) with coconut yogurt. These look amazing! I’m definitely going to make them as I too love coconut. I’m going to keto-adapt them and substitute the sweetners for stevia glycerite instead. Looking forward to it! I know it’s wierd but one of my coconut fixes at the moment is coconut shower gel, I get to smell of it alllll dayyy long, making coco-loco cravings worse. I love a good old fashioned coconut macaron – the kind with rice paper, mmmm! I always loved bounty! And now I can make it? In your recipe you wrote melted coconut, can you specify if its coconut oil or coconut butter? Thanks. chocolate-dusted coconut flakes over vanilla ice-cream – yumm! Coconut gooooodness! MMMM My mum makes similar things – shredded coconut mixed with coco powder, coconut butter, some of that agar nectar stuff – make mounds of goodness, shove in the dehydrator machine – SOOOOO GOOD! My fav coconut fix (bit of a londoner inspiration!) is a smoothie for breakfast – frozen banana, fresh banana, coconut cream or milk (obv a bit of hazelnut/soya milk is needed for some frozen banana loosening if coconut cream is used!) CRUNCHY peanut butter, dark chocolate sauce and almond butter. Add mason jar and straw – easy breakfast for the drive to work. Its like healthy icecream for BREAKFAST! I love adding a splash of coconut milk to my oatmeal along with a sprinkle of unsweetened coconut! I love the dried coconut that tried in a trip to Hawaii. I could eat it all day, like if they were chips! I pretty much add shredded coconut or coconut milk to everything I bake these days. Can’t wait to try these candies! Girl Scout Samoas!!! So bad, but so good! My favorite way to enjoy cocnut has always been coconut custard pie ( please, someone find a way to make that raw!). But the quick and easy way for me to enjoy coconut is to grab an Almond Joy. This recipe looks so totally awesome! I can’t wait to try it! I’m a total coconut obsessed person too and I hope your train never stops. My favorite coconut fix? Macaroons, most definitely! I LOVE coconut! Just made coconut ice cream last night 🙂 Can’t wait to try these! Oh also I put coconut oil on everything. Not the standard way to get a coconut fix, but it’s just too good on oatmeal! My favorite coconut fix is panna cotta, made with just coconut milk, maple syrup and gelatin. These look gorgeous! I’ve been so excited for Emily’s book to come out – I just haven’t got around to getting one yet. Soon! Coconut everything is good. Raw vegan coconut key lime pies, coconut rice with sea bass, coconut peanut butter… give me all the coconut! Definitely making these soon. Come at me, bounty balls. Coconut in my breakfast–refrigerator oatmeal, regular yogurt, regular oatmeal, whatever it is–is something I have everyday! Coconut oil on popcorn is yummy, too. I’m not the biggest fan of coconut, but these look amazing! Since coconut isn’t my favorite, I like to add it to my raw candy bars or granola bars for that extra crunch and bit of sweetness! oh. my. dear. aaaaand I’m drooling all over the place. I love coconut in desserts like German chocolate cake or for breakfast in granola bars! Oh my goodness, these are lovely! I love coconut…and of course, chocolate. Yumm. Beautiful photos by the way. You’re so talented! I love that speckled plate! Coconut nut butter – YESPLEASE! This is wonderful, I am working on veganizing our family, and this will help convince them! I’m not on the coconut train with you. Sadly. But I must say you make it look delicious!!! I’ll just wait quietly and patiently in the station waiting for you to disembark. Acutally, Almond Joys are my go-to when craving coconut! Best coconut fix? 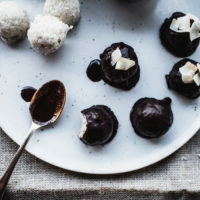 Coconut macaroons dipped in dark chocolate! I feel that coconut is best when not to strong, but I like adding it to already tropical baked goods. I’m so on this coconut train!! Thanks for sharing…can’t wait to give them a try! 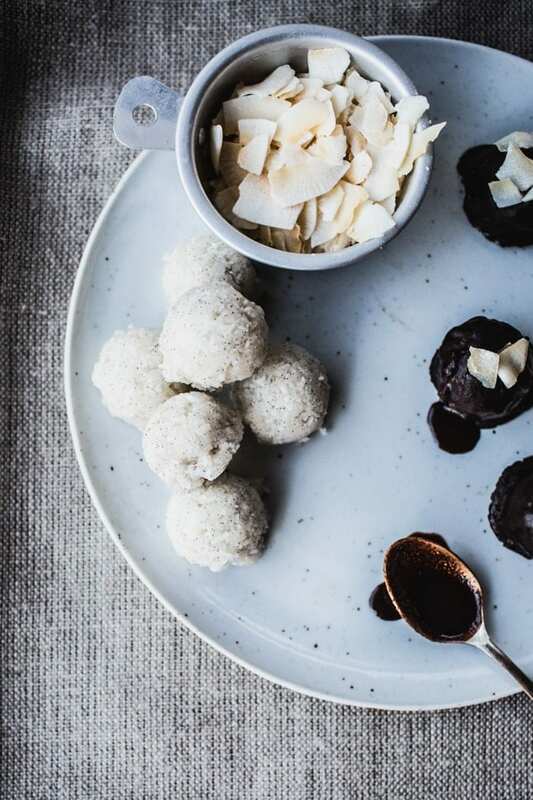 My fav way to eat coconut is in chocolate coconut macaroons! I love coconut macaroons with a drizzle of chocolate and old school rice paper on the bottom (I have never been able to find rice paper in the shops for homemade versions tho). But wait!! HELLO PINA COLADA!! That’s what little coconuts hope to be when they grow up. Hi! My name is Aylin Ilkmen, and I am a religious Top With Cinnamon reader/baker, and for the coconut giveaway, I was wondering if I could still enter if I am from Canada? Btw…you whisk up the sweetest recipes and capture the optimal moments of your delectable treats! Coconut macaroons are perfect for when I’m craving coconut. Mmm! I’m definitely a coconut lover! I’m loving the coconut! I just made some coconut bread the other day which was delicious. These will have to be my next coconut-y treat. Also, thanks for posting such great recipes that are vegan AND gluten free. I have some co-workers with dietary restrictions and this is one of the first places I come to find treats for them. Could I substitute coconut nectar for the agave syrup? Thanks! I’m sure that’d be fine! This is what I’ve been waiting for since I discovered Emily’s blog last summer!!! 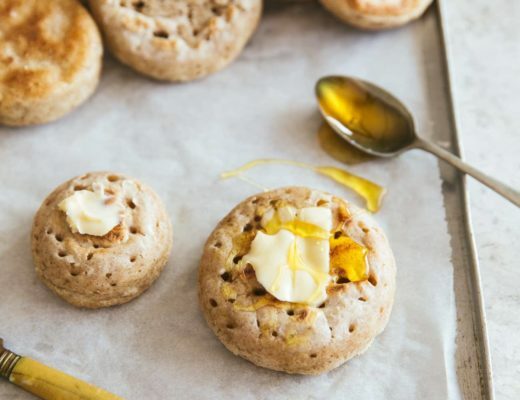 These sounds positively delish – a perfect thing to use the last of my coconut butter on! I’m addicted to coyo at the moment, with some almond butter and molasses stirred in. Coconut of any kind is good – once I made myself sick off of coconut caramel chocolate chunk ice cream. I think it was worth it. Thank god for coconut – otherwise, what would I do as a vegan??? I lurv almond joys! These look dang good. these look so good I am going to share it on the Candy Tree Gluten Free Licorice Facebook page, and the Orgran one too. coconut chobani is never a let down ! … i get a coconut fix when using coconut oil to take off my makeup everyday ! such a nice smell! Hi! I am from Canada, and I am an avid reader of your blog! Which is so Sweet! I LOVE Bounty and I love coconut, so when I saw this…I couldn’t believe it! I was wondering, can people from Canada be eligible for the contest? I am all about fresh coconut. You get the water, and the meat… What’s not to love? But still obsessed with ALL things coconut. I love young coconuts, just gimme a knife, a hammer, and a spoon! I’ve always loved coconut – from the flesh, the oil to the water! Coconut’s always staple back home (in Philippines) and here in Brisbane it’s precious (more then the ring!) Coconut oil on toast, coconut water sweetened by anything I could find in my pantry. And I’ve been inlove with the raw coconut balls that they sell in the fresh market and buys them every Wednesday I go there! I love those big coconut flakes! I can just eat them plain. Toasted coconut chips! I could munch on them all the live long day. My favourite way to get a coconut fix is in a Thai curry (coconut milk!) I’m actually making one right now, coincidentally 🙂 Love the look of your bounty balls! Perfect recipe, can’t wait to try it! Thanks! Love coconut in dried fruit and nut trail mixes or fresh from my favorite coconut farm in India. really really good coconut gelato add some dark chocolate fudge swirls in it and I’m in heaven! I laughed about the celebrations comment, because it’s so recognizable. I’m all for the bounties though! These recipes look incredibly good, bookmarking them for sure! These sound to die for I will def be making them! Yum! These sound amazing 🙂 Her cookbook looks like it would be a great read, too! I love that I can make coconut things and get to eat them all, as I am the only one in my house who likes coconut. Something is seriously wrong with the people I live with. I love your blog. And this recipe is just lovely! I”m with you on the coconut crazy thing. Bountys – especially the dark chocolate ones – are amazing! My favorite way to eat coconut is in coconut creme pie. Delish! To get that coconut fix I mix it in with my cravings – on top of protein bars, in soups, shredded on salad – it works for everything! A local chocolatier here in Minnesota used to have their own fabulous Almond Joy-like candy bars, but they stopped making them a couple of years ago. I’ll have to give these a try! coconut cream cake! it’s so delicious and perfect for the holiday season! Thanks! I am also OBSESSED with coconut! I can’t wait it try these! I love to make macaroons! 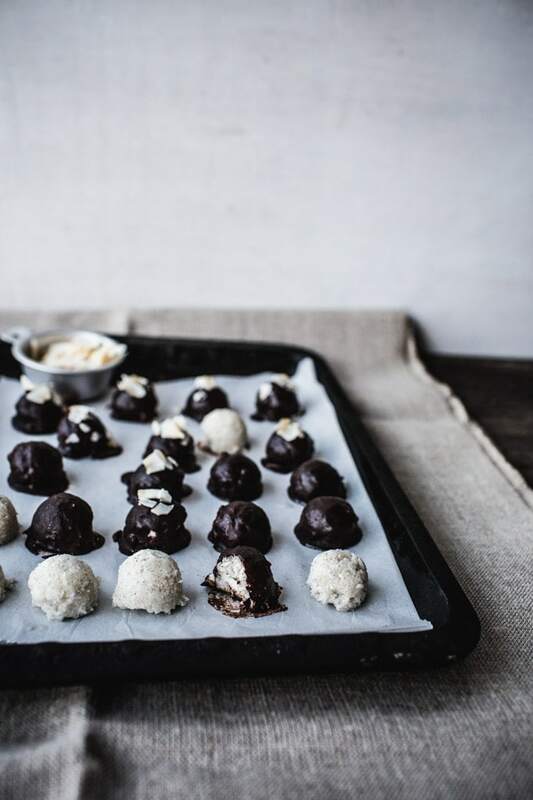 I love to make raw coconut chocolate bites. I love making coconut ice cream! SO easy and good! 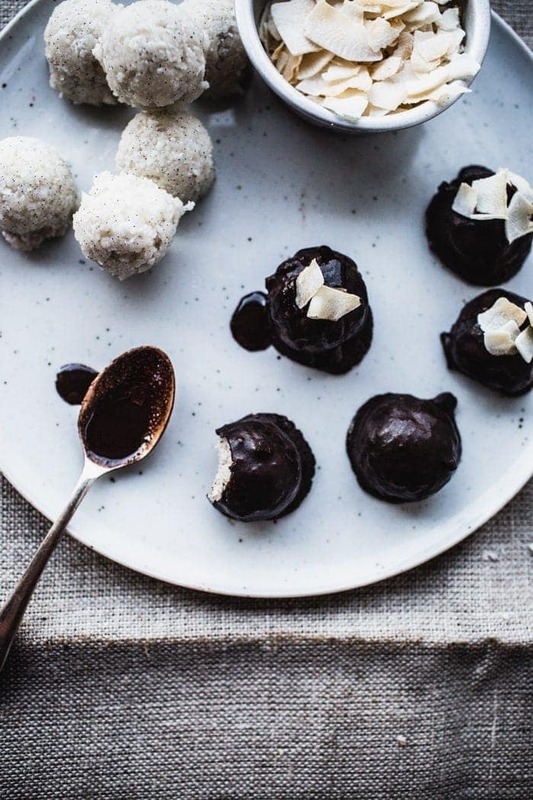 I’m game for any coconut fix that also involves dark chocolate! Coconut chocolate chip ice cream is a favorite of mine. I use coconut butter or coconut cream concentrate in smoothies. I’m loving this version of Emily’s yum yums. Photos are gorgeous as usual. This may not be traditional sweet, but I LOVE thai green curry made with coconut milk!! So delicious. For my coconut fix, I don’t think there’s anything better than homemade coconut butter slathered on almost everything although if I’m really desperate than mounds definitely does the trick too, lol!!! To get my coconut fix, I really enjoy making a homemade coconut cream pie or a piece of chocolate-covered candy filled with coconut. Yummy. I love coconut milk with fresh fruit in the morning. It may sound strange, but I get my coconut fix when I eat a delicious bowl of Thai Coconut Soup. Oh. My. Goodness!!! These look wonderful! As a coconut fanatic I can’t believe I’ve never had coconut butter. You may have started a new addiction! My favorite way is just to eat some shredded coconut! Or a mounds bar… or coconut butter. Coconut is so good! I’m not a fan of Almond Joys but I would eat these!! I love getting my sweet coconut fix with homemade coconut granola in a bowl with almond/coconut milk – yum! Almond Joys and Mounds have always been my candy of choice. But really, if it’s got coconut in it, I like it. Occasionally I’ll treat myself to a coconut macaroon dipped in dark chocolate from Godiva. Always worth it! I love the original mounds or Bounty bars…but honestly, Godiva has these dark chocolate dipped coconut macaroons that I dream about! The way I get my coconut fix is toasted coconut cupcakes yum! Coconut is my favorite, cant wait to try to make the candy. The book looks amazing. Thanks for the recipe and the giveaway, looking forward to more great recipes. Chocolate coconut pudding. Oooh maybe with a dollop of peanut butter or other nut butter! I used to hate coconut, but now I’m totally on this coconut-crave-obsession sorta thing.. anyways, I made this today and OH.MY.GAHD.! the only thing I changed was the 2 dates I put in the filling, to act like the sweetner (totally worked btw). Awesome recipe, just awesome! Almond Joy is my all time favorite candy bar. A healthy raw Almond Joy, well who wouldn’t be jumping for Joy? I love the Samoas Girl Scout cookies!! I love the chewy coconutty texture. Your treats look delicious! I love toasted coconut sprinkled over fruit and vanilla yogurt, or mixed into homemade granola. Thanks for the giveaway! Coconut oil most often replaces butter in my baking and I sometimes just eat it out of the jar, it’s so yummy. I also use it to soften my heels…..
i have a love/hate relationship with coconut. My stomach is extremely delicate and i cant digest it for some reason so i usually despise coconut. But every once in a while i get this weird intense craving for ANYTHING and EVERYTHING coconut flavored. Example: i just made a coconut mousse, coconut curry, coconut icecream and almond and coconut milk yesterday. soooo..i think im gonna save this little gem for my next coconut craze! I love to get my coconut fix by toasting coconut flakes and adding them to granola for a extra sweet and crunchy kick! No-bake macaroons! My Homer Simpson moment. I love to make my morning mocha with coconut milk, honey and orange blossom water instead of sugar and cow’s milk. I swear it tastes creamier and so much more fulfilling. 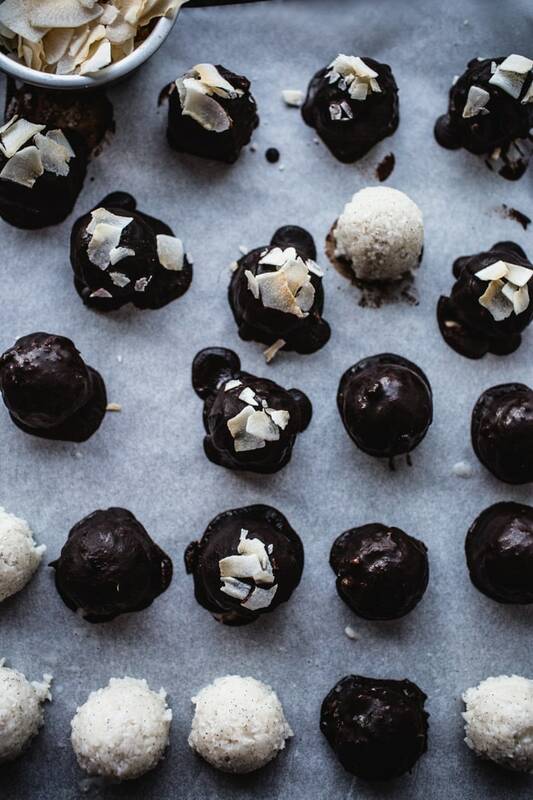 My favorite coconut treat is homemade coconut bon bons that my grandma makes at Christmas! They are sooooo good. I love all things coconut! Especially vegan coconut bacon, coconut milk ice cream, & toasted coconut! love me some coconut curry! My favourite way to get that coconut fix is by sprinkling desiccated coconut on my porridge…so good! I love anything with coconut, and especially with cinnamon (like Irish potatoes!). I like to eat a slice of Coconut Cream Pie when I need a sweet coconut fix. 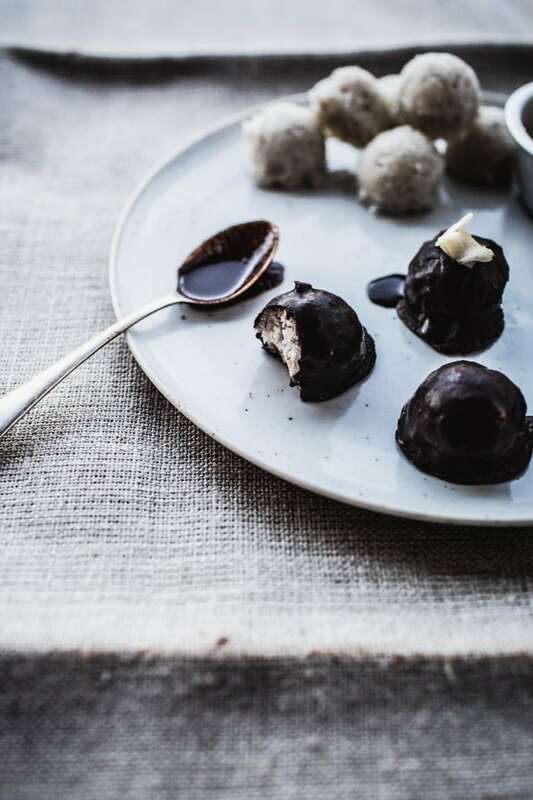 Almond joys are my favorite coconut treat, looking forward to making this healthy version! I just made this recipe today & it turned out GREAT! Followed directions and ingredient list exactly. My normally ‘sugar-holic’ teen daughter loved it too. I def need to double the recipe next time. I also had the idea to add mint extract to the filling, thus making a Peppermint Patty version 😉 Thanks for sharing this recipe! !